It’s 1949 Los Angeles, the city is run by gangsters and a malicious mobster, Mickey Cohen. Determined to end the corruption, John O'Mara assembles a team of cops, ready to take down the ruthless leader and restore peace to the city. THE REVIEW: Gangster Squad has many little moments that make the film fun to watch. Moments like Officer Kennard (Robert Patrick) thinking it’ll be smart to pull the iron bars off a prison-cell window with a car and seeing his reaction when it fails miserably. Or moments like Officer Keeler (Giovanni Ribisi) discover new ways to wiretap Mickey Cohen’s (Sean Penn) home and places of business. These scenes help build the camaraderie between the core group, the “Gangster Squad”, and keep things interesting so you want to see what happens next. You also have the mob side, led by Mickey Cohen and his lackeys, all of whom are ruthless and bloodthirsty, seeking to gain total control of the Los Angeles organized crime scene circa 1949. But while these little bits of greatness are scattered about the film, overall Gangster Squad is quite lacking. Everything just seems to blend together and wash over you. Nothing about this film — visually or story wise — is memorable or unique and I will likely forget most of what I watched in a couple weeks. The camaraderie I mentioned feels a bit like Ocean’s Eleven but less developed. One moment they’re regular police officers, the next they are part of this secret crime-fighting unit. We get that these are the band of misfits and are the cops that can’t be bought, doing their duty for the City of Los Angeles, but these are nothing more than empty words. The inclusion of family ties for Sergeant O’Mara (Josh Brolin) and Officer Keeler are meant to give meaning to the dangerous situations they place themselves in but it just falls flat. There’s also many comparisons to be made to the plethora of mob films that have preceded it — think The Godfather, Goodfellas, etc. 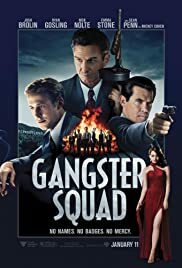 Similar ideas and themes may be present but Gangster Squad just feels inferior in many ways. The period-piece element of the film looks like a thick layer of makeup applied to hide underlying flaws. Sure some of the costumes and set designs look authentic, but 1949 Los Angeles doesn’t feel incorporated enough. The film was based on true events about LAPD officers tasked with riding the city of Mickey Cohen and organized crime, but if you’d have told me it was about Al Capone in 1920s Chicago I would be none the wiser. It’s not to say I found the story unappealing or disinteresting, just that the execution in this film was lackluster and forgettable. If you’re looking for your crime/mobster fix, Gangster Squad isn’t the best film to fill that. It will provide two hours of entertainment, but it pales in comparison to others in the genre.